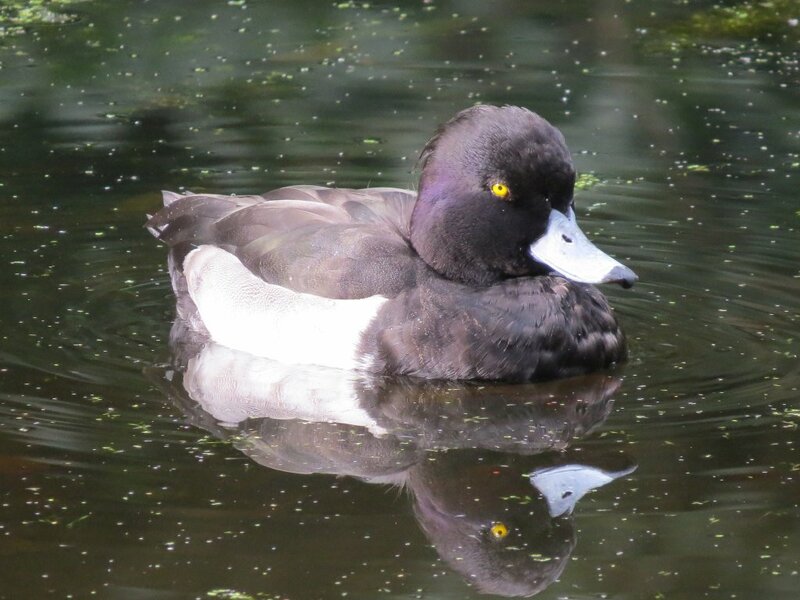 As expected, the coordinated waterbird counts for the Wanstead Park lakes, Hollow Pond (Whipp’s Cross) and Eagle Pond (Snaresbrook) conducted on Sunday 8 March for the British Trust for Ornithology showed that most of our wintering wildfowl have now gone. That said, a count of 56 Gadwall in the Park is still an impressive figure, even though it is less than 15 percent of the maximum at the start of the year. Eleven Pochard still lingered on The Basin, but there was little else of note in the duck department – apart from the Shoveler count. 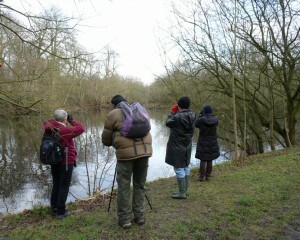 For the second March running, Debbie noted a spike in numbers at Eagle Pond, with 24 birds, and there were 17 in the Park. Even excluding the two birds that Anne-Marie noted at Hollow Pond, that makes a very respectable total of 43, the highest count of winter, suggesting that these birds are assembling prior to leaving for continental Europe. Maybe they are part of a slow eastward passage in anticipation of moving off to breeding grounds? We simply don’t know, but it will be interesting to see if they stick around (unlikely) or if the pattern is repeated next year. Otherwise, there are clear signs that Little Grebes will be nesting again at The Basin and Shoulder of Mutton Pond (as well as Alexandra Lake), and both The Basin and Heronry Lake had a brace of Great Crested Grebes. A Kingfisher was briefly glimpsed by Perch Pond and James picked up two Little Egrets on the River Roding. Thanks to All this data provides a valuable resource for the BTO, so thanks to Kathy, David, Bea, James, Andrew, Haydn, Saci, Debbie and Anne-Marie for giving up their time on a Sunday morning. Despite this, the numbers produced provide useful information for the British Trust for Ornithology (BTO), helping them to evaluate which species are faring well and which are in trouble. Locally, we have a team of tireless counters, so during the winter months not only Wanstead Park and Wanstead Flats but Eagle Pond (Snaresbrook) and Hollow Pond (Whipps Cross) are covered. We also now have an almost complete record for the months of autumn, winter and early spring stretching back to January 2009. That makes it possible to look at trends and, maybe, draw some conclusions. Combined counts for Wanstead Park, Wanstead Flats and Eagle Pond can be compared now over seven WeBS counts. Systematic counting has only recently restarted at Hollow Pond, so a comparison cannot be made including that site. Browsing through the figures, trends for two birds jumped out at me: those for Gadwall and for Moorhen. Figures for the recent WeBS count produced record January numbers for both species. The main concentration of Gadwall in our area is on Alexandra Lake and the lakes of Wanstead Park, all waters where there is plentiful weed for these ducks to eat. Numbers at Eagle Pond rarely exceed single figures. The rate of increase was slow and irregular in the first years of the sequence: 40 in January 2009, 24 in January 2010, 101 in January 2011 and 88 in January 2012. During these years, the peak counts were respectively 111, 86, 137 – and this is where things really start to lift off – 200+ in December 2012. Since then, the rise of the ‘Gadwall army’ (as former Wren newsletter editor Steve Swaby has dubbed it) has been seemingly inexorable, with 363 in December 2013 and 459 in December 2014. The 422 counted in January 2015 was the highest-ever January count, and the biggest count on a WeBS day. Gadwall was a pretty rare bird in London not that long ago. According to Andrew Self (The Birds of London, 2014), the average wintering population in London was only about 100 in 1970. Wanstead Bird Reports from the late 70s and early 80s mark it out as a local rarity. However, by the end of the century the London winter population was around 2,500, and Self describes an average of 600 in the Lea Valley in recent years. The peak count (at the time of publication of his book) he lists was 453 at Cheshunt GP in December 1989. A larger share of London’s birds is now wintering in Wanstead, but there is no obvious reason why. Clearly there is a plentiful supply of weed on which the birds can feed, and maybe the growth of weed in our lakes has made it easier for these attractive dabbling ducks to feed by upending. Whether other factors are involved – such as an increase in the continental populations from where most of our birds originate, or problems with the food supply at locations where they previously wintered – is not clear. One thing is certain, we should enjoy the phenomenon while it lasts because like pretty much everything in nature, numbers go down as well as up. Cutting of the weed in The Basin later this year may well impact on the numbers that lake can support next winter. 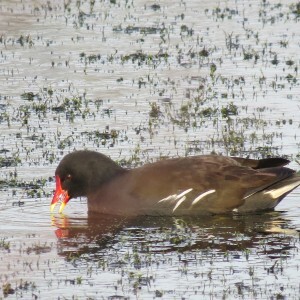 Another success story, though much less dramatic, concerns Moorhens. Again, January WeBS figures for the years 2009-2015 show a consistent increase: 20, 21, 35, 44, 2013 figure lost by a careless recorder!, 66 and 80. And maximum counts for those years were as follows: 47, 56, 35, 65, figure unavailable, and 78 in 2014. Judging by the number of juvenile Moorhens seen on our lakes in recent autumns, I believe this increase can be put down to local breeding success. The species nests in emergent vegetation, where they are better protected than Coots’ nests, which are exposed stick islands, easy pickings for Lesser Black-backed Gulls. With the highest-ever January WeBS count for the species this year, I reckon we could be in for another bumper breeding season. 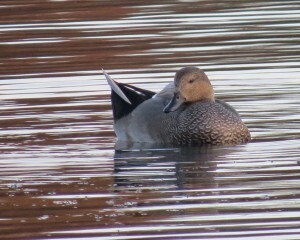 Forgive me if I keep going on about Gadwall in the Wanstead area, but if you have something good why not shout about it? After numbers steadily climbed during the autumn I did wonder whether last year’s record total would be bested. Well, it has been. The fine efforts of Dan and Nick on Saturday 13th December saw to that. Dan counted 368 in Wanstead Park and Nick added 43 at Alexandra Lake, on Wanstead Flats, producing a magnificent total of 411. If you were to cheekily add Ann-Marie’s 21 on Hollow Pond – a little outside our core area, but not much – we have 432 of these fine dabbling ducks. Even without, the Wanstead ‘patch’ is presently the pre-eminent site in London for the species. Not that Gadwall represent the only waterbird interest. In the past week there have been nine Wigeon and 11 Common Teal in Wanstead Park, with good numbers of the other regular ducks and geese. Two Water Rails have been seen by Shoulder of Mutton pond. And, of course, there are Kingfishers, at least four different stripes of gulls, Moorhens (pictured), Cormorants, Grey Herons, Little and Great Crested Grebes, and Grey Wagtails. Take a look around Wanstead Park: it really is beautiful! The November WeBS count for the British Trust for Ornithology is usually an interesting one, with wildfowl numbers building up as the UK benefits from influxes of dabbling and diving ducks from continental Europe. It was hard to believe the date was 9 November as we walked around Wanstead Park’s lakes and ponds in glorious sunshine and with a temperature rising to at least 13 degrees. So warm was it, in fact, that a Red Admiral and ovipositing dragonflies were noted. Following our tried and tested route, around the Shoulder of Mutton pond and Heronry Lake, we noted increased Coot numbers since the October count, and a total of 17 Pochard and 16 Mute Swans on Heronry. There were a few Shoveler, Gadwall and Tufted Duck on Perch, and 87 Gadwall and nine Common Teal were counted on the Ornamental Waters. Some of the biggest surprises were on The Basin, where a count of 12 Egyptian Geese represents the biggest number ever noted on a local WeBS count. However, Tom the water bailiff estimated that there had been up to 30 in the previous week. Where has this influx come from? 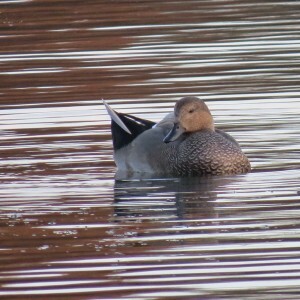 There were another 46 Gadwall on The Basin, along with four Wigeon. The third of the day’s Kingfishers was at the Overton Drive end of the lake. Overall, in addition to the noteworthy counts of Gadwall and Egyptian Geese, the totals for Coot and Moorhen were also high. Every autumn it happens. But it’s still exciting when it does – the gradual filling out of Wanstead Park’s lakes with wintering wildfowl. Last year the clear winners were Gadwall, whose numbers peaked at more than 300 around the turn of the year, in the process establishing Wanstead Park as one of the key sites in London for the species. This year this unobtrusive dabbling duck seems to be at it again, with numbers logged on the WeBS waterbird count on Sunday 12th October reaching 101. It will be interesting to see how many more arrive in the next two months. 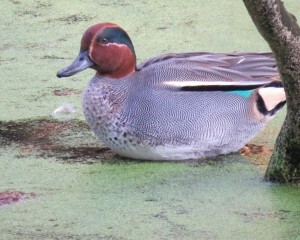 Even more unobtrusive are Common Teal, which often tuck themselves away under overhanging vegetation in quieter parts of the Ornamental Water. WeBS counters found seven birds on Sunday but this species – another dabbling duck – is notoriously difficult to count accurately in Wanstead Park and I would not be surprised if there were already more there. A pleasant surprise was the presence of five Wigeon, two on the Basin and three on Heronry. 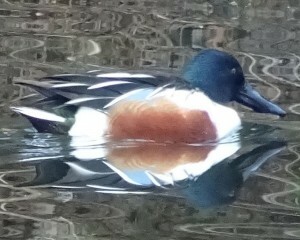 This is a scarce duck away from the coast or the Thames. Odd birds sometimes turn up in very cold weather, so to have such a number in mild conditions is something of an event. 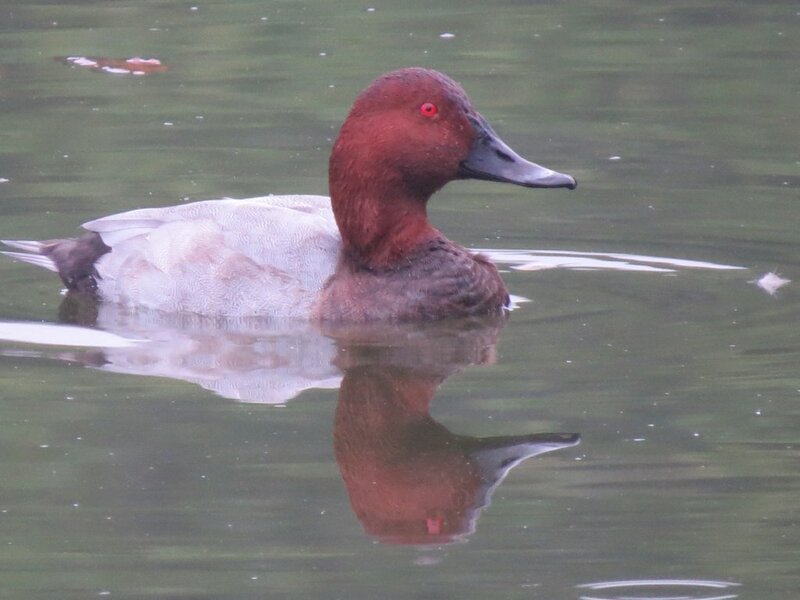 Many of our Pochard seem to have moved on, and my suspicious is that the September peak (74 birds) involved local breeders rather than an influx from continental Europe. Numbers of Mallard and Tufted Duck haven’t yet started to increase noticeably. Other birds of interest included five Great Crested Grebes on the Basin, single Kingfishers seen on Heronry and near the Cedar of Lebanon, a good count of six Grey Herons, two Grey Wagtails and a Little Egret. Hollow Pond: 7 Mute Swan, 94 Canada Goose, 2 Greylag Goose, 2 Egyptian Goose, 30 Mallard, 3 Shoveler, 17 Pochard, 16 Tufted Duck, 1 Grey Heron, 2 Great Crested Grebe, 48 Coot, 10 Moorhen, 68 Black-headed Gull, 2 Herring Gull. Thanks to David Giddings and Andrew Spencer for their able assistance to do the count, and to Nick Croft and Ralph Potter for additional records. We now have a regular counter at Hollow Pond, Whipps Cross: welcome to the team, Anne-Marie White! Last winter, Wanstead Park attracted record numbers of Gadwall. 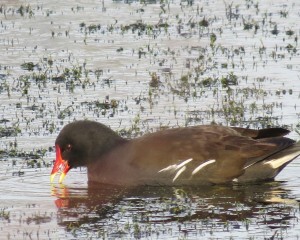 This year it seems to have hit the jackpot with Pochard. 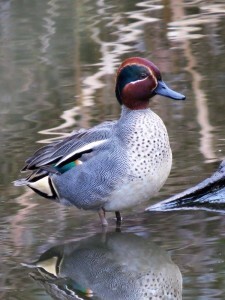 In recent years, this duck has adopted a habit of arriving in early September – before the build-up of other winter wildfowl, with numbers then thinning as the autumn progresses. 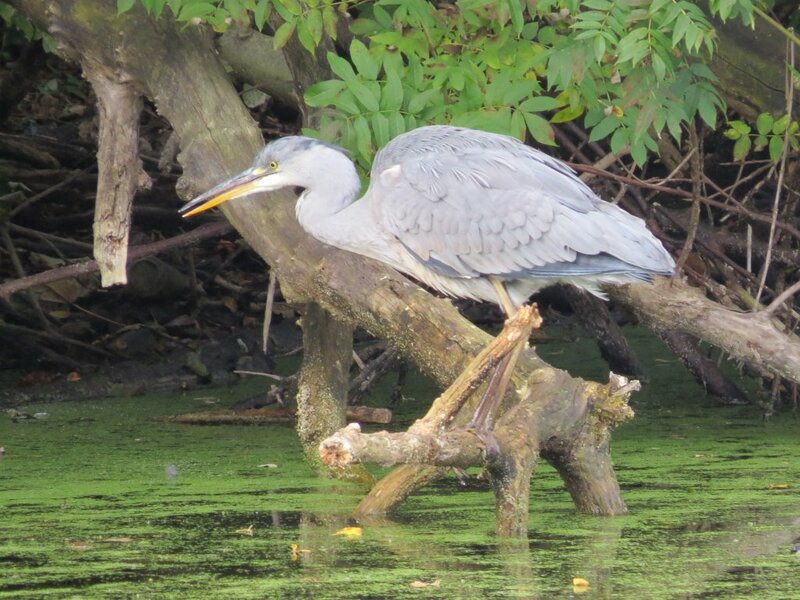 This year they started arriving in late August and have, this week, hit record numbers, with more than 60 on Heronry. Joining them this week have been single Red-crested Pochard and Wigeon.